One night in 1980 my friend John Steinmetz couldn't sleep. Instead, he drew pictures of blenders, those friendly, familiar kitchen companions. But these blenders came with unexpected labels on their buttons in place of the boring Whip, Frappe or Liquify. Soon John shared his ideas with me and together we created The Blender Book, a xeroxed holiday greeting for our friends and families. The reactions ranged from baffled amusement to confused bemusement. 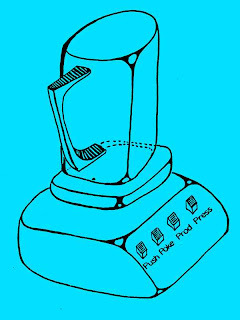 The back cover of The Blender Book showed a blender with four buttons marked Push, Poke, Prod and Press. We thought "What a good name for a publishing company." and so the imaginary Push Poke Prod Press was born. John and I hired each other as "Assistants to the President" and we awarded ourselves fictional startup grants from General Malaise, makers of the Electric Bowl, and the National Appliance Foundation. 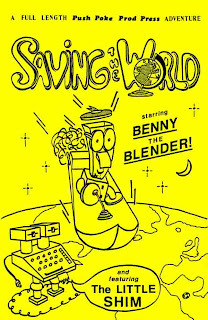 Saving the World , billed as "A FULL LENGTH Push Poke Prod Press ADVENTURE, starring BENNY the BLENDER! and featuring The LITTLE SHIM", was a comic book. Our hero, Benny the Blender, is featured in the masthead of this very blog, look at the top on the right. He was a blender of few words but with a good heart and bad eyesight (notice the thick glasses) who should never have been given a license to drive an air car. The Little Shim, Benny's sidekick, was an early personal computer - some sort of sentient, mobile Apple III or Commodore 64 with two floppy disc drives for eyes and a penchant for getting into trouble he can't get out of. 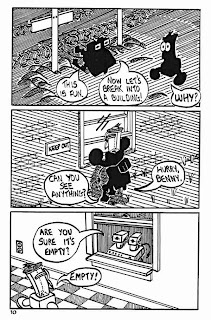 Here's a sample page from Saving the World. Click on it (or any illustration) for enlargements. You can download the entire Saving the World in PDF format here. Happy Holidays, everybody - even if is a bit late. 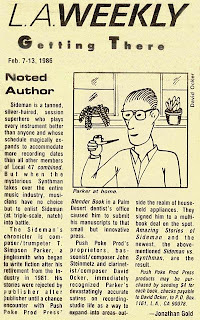 The two books which featured John's stories about Sideman, a mysterious super-hero L.A. studio musician, were the most popular. 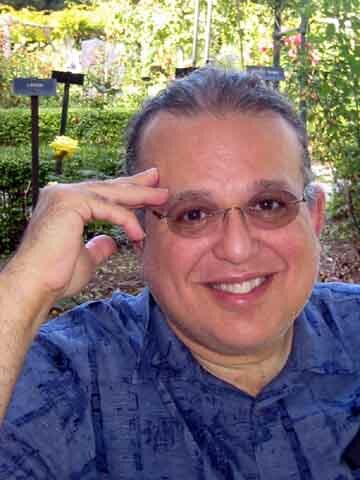 John wanted the stories published under the pseudonym T. Simpson Parker, ostensibly an old studio musician himself, now retired to Palm Desert where he raised succulents. Imagine my surprise to discover T. Simpson Parker listed in an online library catalog. Click here to see that. Four of the six PPPP books made it into a certain university library under the category Nonsense Literature, American. Finally, here's a clipping from a Los Angeles Weekly of February 1986, written by Jonathan Gold. Yes, the same Jonathan Gold who went on to win some very important journalism prize or other and will surely be mortified to read this bit of doggerel online. Marvel at just how deeply a tongue can push into a cheek; probably the sign of a good food critic, huh? Thanks for posting these, David. I think the world may finally be ready for a tale about a sentient blender. Certainly the world still needs saving. Mr JG, back in the day when he was critic at large. Now it's all about fine foods and private schools.